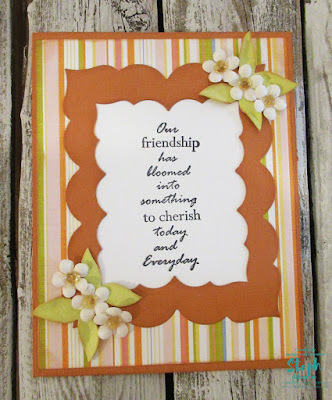 I've used the Friendship to Cherish clear stamp set, stamping it on black cardstock. I created a window effect by die cutting the striped paper and slipping the stamped phrase behind it. Then I created a frame to fit around the phrase. Small flowers and leaves were used as embellishments in 2 opposite corners.